How do you choose your metal stamping supplier? The decision can mean the difference between meeting and missing a production deadline, coming in on budget or incurring a cost overrun, and producing a zero-defect product or a malfunctioning one. 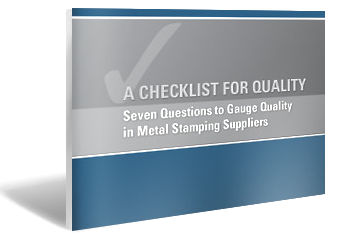 This 19-page ebook, "A Checklist for Quality," provides objective evaluation tools for evaluating metal stamping companies. By asking metal stamping companies 7 key questions, OEMs can assess quality levels and make informed decisions.